A friend of mine from my days as a newly wed (has that really been almost 9 years ago?!) recently reviewed this book on Goodreads. 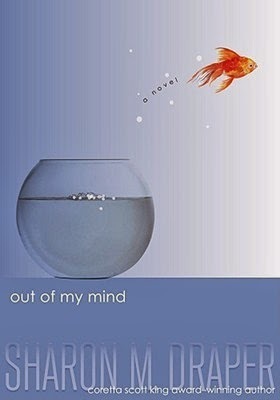 Her little girl has Rett syndrome, and after reading the book, she mentioned how she saw so many similarities between her own family's situation and that of the girl in the book. I had looked at this book before but was instantly more intrigued after reading my friend's reaction to it. Somehow, knowing that a mom with a daughter with special needs didn't hate it made me much more interested in reading it. So interested, in fact, that I checked it out from the library the very next week. Melody, the girl in the story, was born with cerebral palsy. She is confined to a wheelchair, cannot speak, and has limited motor skills (she is able to use her thumbs, but that is about it). She needs help eating, dressing, and going to the bathroom. But Melody's mind is sharp, intelligent, and incredibly active. She has a photographic memory and a delightful sense of humor. But no one knows it. Not even her parents or Mrs. V, who definitely understand her more than most people, have any idea what Melody is capable of. Melody feels like she is suffocating. Every day, she goes to school and sits through nursery songs and alphabet letters while her mind races with complex thoughts and feelings. But happily, things begin to change at the beginning of sixth grade. For one, Melody and some of her classmates are invited to be a part of some of the regular classrooms during the day. Then one day she and her aide discover a computer that could possibly give voice to her thoughts. Suddenly, Melody's world is opening up, but she discovers that even when she gets the same opportunities as other kids, some people refuse to see past her disabilities. The story is told in Melody's voice, which I found equal parts fascinating and annoying. Her frustrations with daily life, her desire for a friend (not just someone to be nice to her), and her delight and excitement in the world around her were real and poignant. But sometimes she came across as extremely arrogant and rude. Since I listened to it, I had a hard time knowing if this was due to Melody's words themselves or just the narrator's tone of voice (which definitely had a whiny quality about it). Also, I felt like the author went a little overboard making Melody into the brightest, smartest kid on the planet. Then, it was as if she realized Melody was a little too smart, so she gave Melody a slight weakness in math. I felt like the exceptional, extraordinary intelligence made Melody not as easy to relate to and not as likeable as a person (not saying that we all have to be of average intelligence, it just felt overdone). However, I really loved the relationships between Melody and her little sister, Penny (who does not have cerebral palsy), her parents (who are very supportive and loving), Mrs. V (her neighbor who goes to great lengths to let the real Melody out), Rose (a hesitant friend who is willing to give Melody a chance), Melody's aide (enthusiastic and positive), and the teachers and students (who represent a wide range--from mean to speculative to encouraging). But the thing I loved most about this book was just the way it opened my eyes to the adults and kids around me. For example, every morning when I drop Aaron off at school, I see the bus unloading the special needs kids. I wonder what their experience at school has been and if some of them are feeling trapped and misunderstood? As far as the quality of the writing, this book did not leap to the top of my favorites list. But in the way of content, I think this story is invaluable and should be required reading for 4th-6th graders. I would love to discuss it with a book club someday.